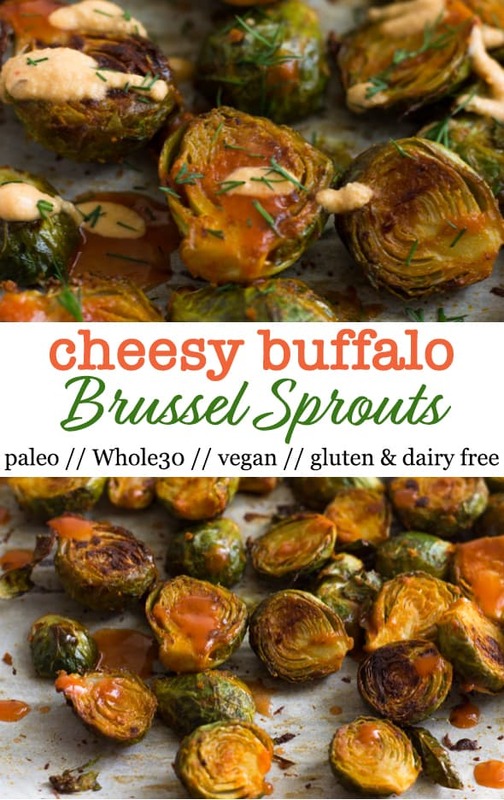 Vegan and Whole30 approved, these Cheesy Buffalo Brussel Sprouts will be a sure hit! 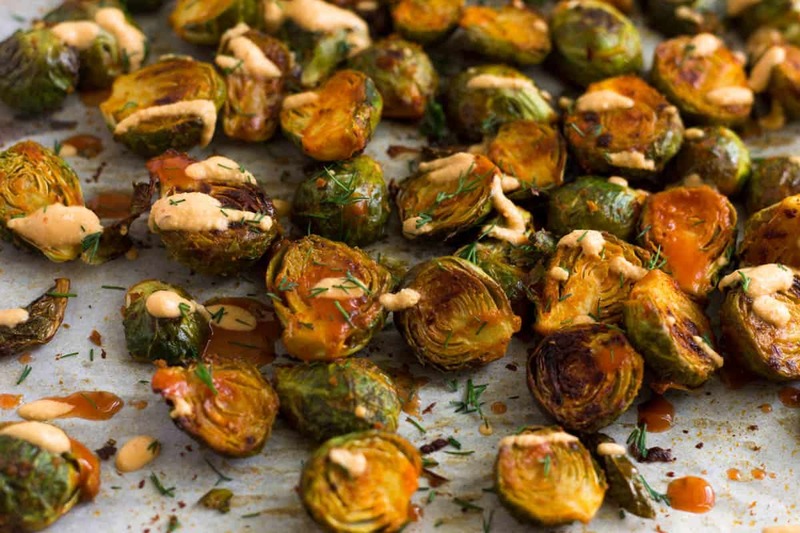 Perfect for an appetizer, side dish, or for game day snacking! 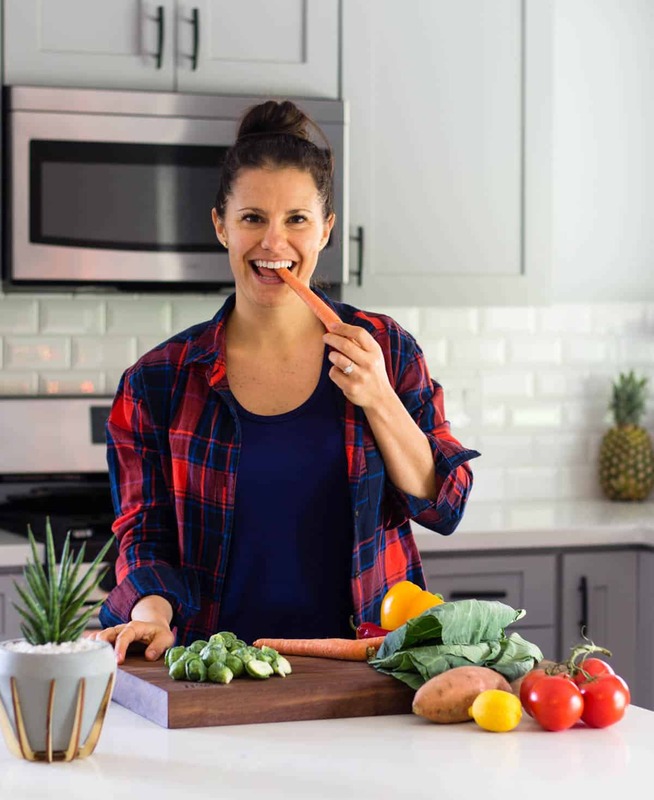 Dairy free, paleo, and gluten free too. So the other weekend Michael was headed to Costco to pick up some things. I asked him to grab some brussel sprouts from there since they usually have a decent sized bag for cheap. We have bought them a bunch of times so I thought nothing of asking him. On the other hand, if you ask him to buy cilantro, he will usually come back with parsley. Anyways, he comes home with all the stuff and I am going through it and putting it away. 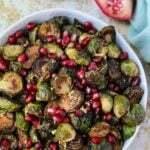 I come across a 4# bag of frozen brussel sprouts. I’m like “what is this?” and he’s all like “brussel sprouts” in a happy voice. Queue me being like wtf. Poor guy, I know he was just trying to help, but frozen brussels are a no go. Especially when trying to recipe test. 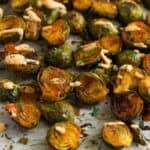 I think frozen veggies can be a great cheap alternative to fresh, but I feel like this is why people don’t like brussel sprouts. They have them frozen and then steamed. That is not a good way to eat brussel sprouts in my opinion!! My favorite way (and usually only way we do them) is roasting them. Toss them in some cooking oil and crank up the oven and they get all nice and crispy (all little burnt is the way to go). I usually toss them with some ginger and garlic, but wanted to change it up some. And with the Super Bowl coming up, all I can think about is everything buffalo. Actually that is probably all the time, hence this chicken fingers, twice baked sweet potatoes, and enchiladas. 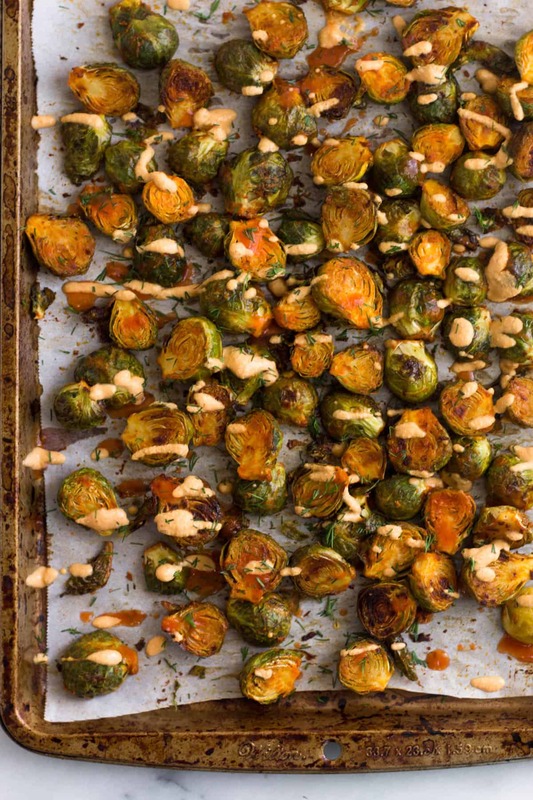 These buffalo brussel sprouts comes together in a few minutes and couldn’t be easier to make. All you need is some coconut oil, hot sauce, nutritional yeast, and a few spices. 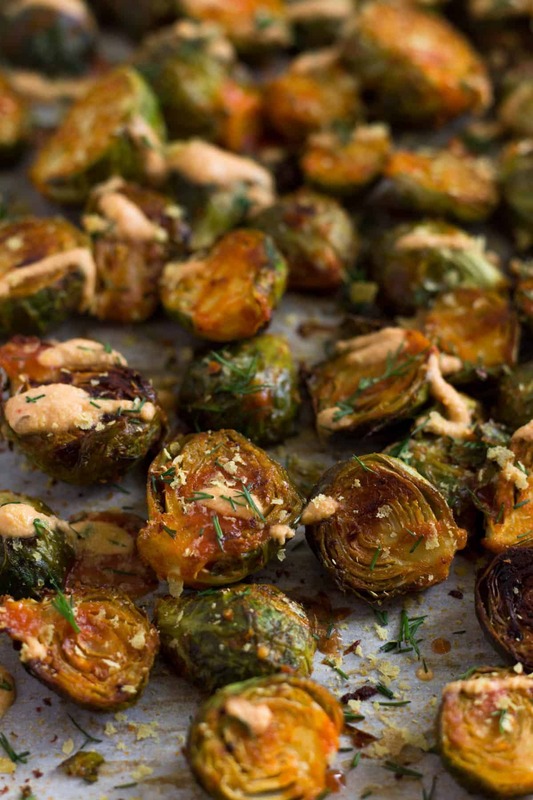 Toss it all together, roast them, and voila. 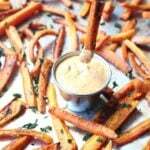 Totally optional is dill and my cheesy buffalo sauce to top them off, but not really optional because yum! This would be great for your Super Bowl party, meal prep, or just an easy side for a weeknight dinner. If meal prepping, just try not to eat half the pan when they come out of the oven like I tend to do ? 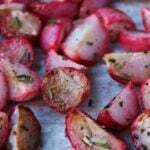 Preheat oven to 375 degrees Fahrenheit and line 1-2 baking sheets with parchment paper. In a small bowl mix together coconut oil, hot sauce, nutritional yeast, garlic powder, paprika, cayenne, and salt and pepper. 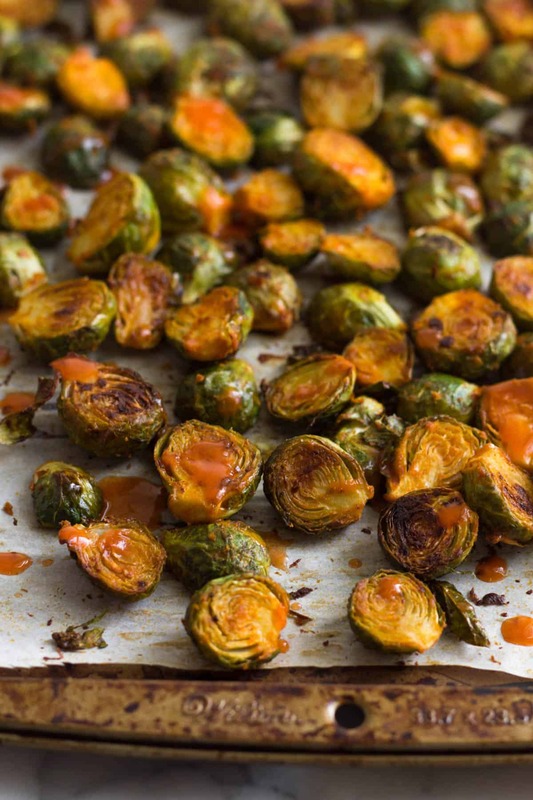 Add brussel sprouts to a medium bowl and add hot sauce mixture. Toss to combine. 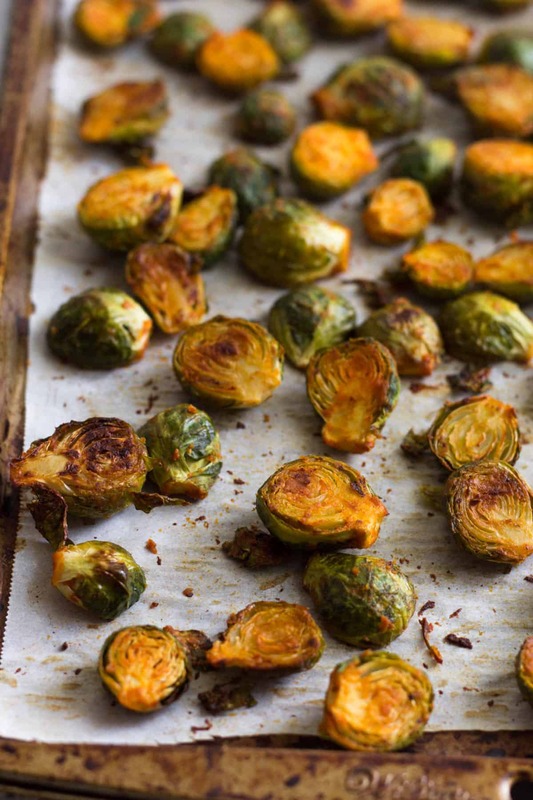 Spread out brussel sprouts even on baking sheets making sure they aren't too close so they don't steam. Roast for 30-35 minutes, flipping once halfway through. Top with optional toppings and enjoy! Yay! Let me know how they go! Why the yeast? Can you make without it? 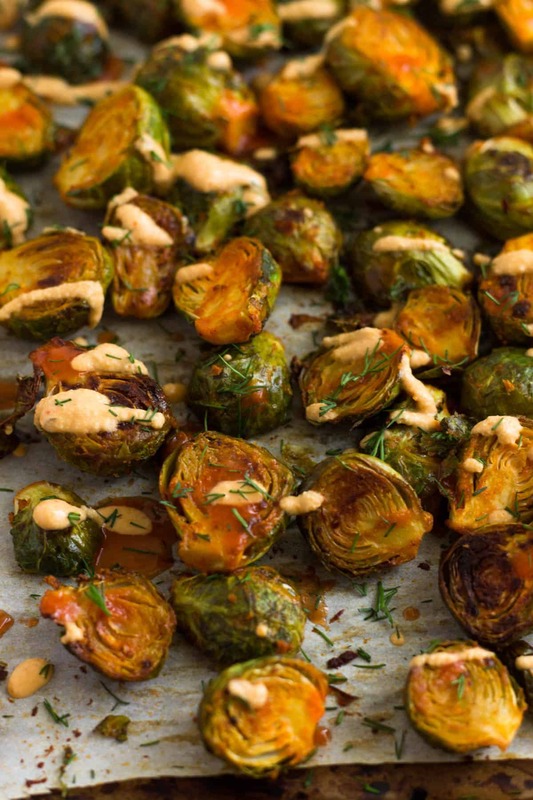 The nutritional yeast adds a cheesy flavor without dairy. 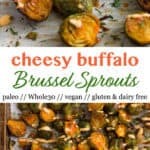 You can definitely omit it as it’s not needed, you will just have buffalo brussel sprouts!